Big Ditch Brewery is a hospitality project from Iskalo Development Corp. Candice served as interior designer under contract with Iskalo, and coordinated between the company’s architecture, construction and design teams, under the leadership of founder, president and CEO Paul Iskalo and director of architecture Michael Chadwick. The location, on East Huron Street in downtown Buffalo, is a former warehouse and one-time NFTA bus garage, which presented unique design challenges for creating a cozy and inviting brewery and restaurant. The project was originally slated to be a tasting room in front of the brewery, but soon evolved into a full-scale restaurant. The space needed to be warm, inviting and modern, with a reference to Erie Canal history from which Big Ditch’s name is derived. It also needed to appeal to the historical significance of its Electric Corridor neighborhood, with a glass façade to show off the interior and open to the neighborhood. Transforming a raw warehouse space into a refined interior always relies on the proper selection and execution of many ideas. 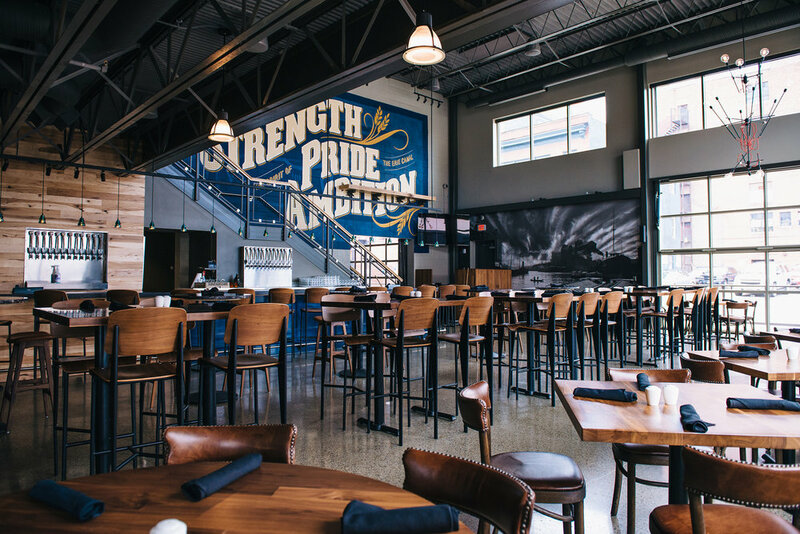 The large beer hall anchors the space, and includes a variety of seating and gathering options for guests to enjoy, from bar stools to standing communal tables to dining tables and booths. 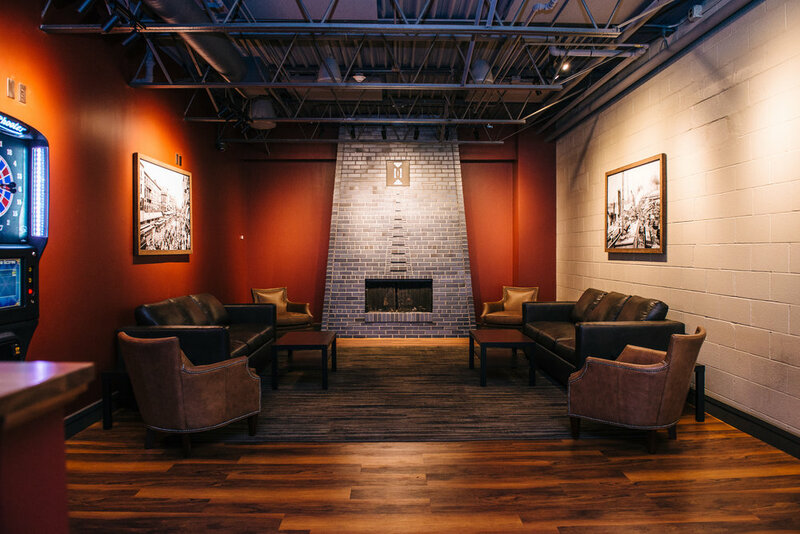 Several smaller spaces are attached on two levels, perfect for recreation, small groups and private parties; elements include a fireplace with soft, living room-like seating, a game room, a small conference room with full A/V capabilities, and many small conversation areas. The biggest challenge was to tie these functions together into one cohesive space with distinct and complementary finishes. Candice chose, in this case, to mix several materials for added excitement and interest. She commissioned a number of handcrafted specialty pieces and also sourced found materials. Reclaimed insulator lights, derived from a local railroad line, hang above the bar. The front of the bar resembles an old, comfortable wooden office desk, and the long bar of an old club room. Dark red and blue are woven throughout the space, in both lighting accents and surface materials, a nod to Americana and the Erie Canal. Custom long community tables have sealed engravings of historic maps of the Erie Canal, from Buffalo to Albany. Upscale materials include a granite bar counter and table tops, concrete bathroom floors and refined concrete counters, a stone façade on the fireplace, and walnut tables and paneling. The Big Ditch project is a success! It celebrates Iskalo Development Corp.’s high standards of quality, and branches off into a new territory, establishing standards for future hospitality projects to follow. What began as a small tasting room with casual décor evolved into a full-service restaurant with upscale-rustic design. 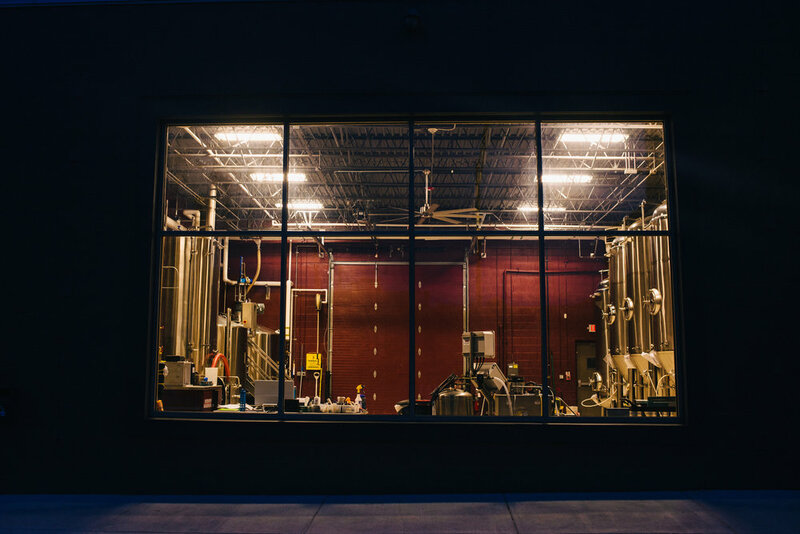 It’s a brewery and restaurant for all walks of life—everyone can go there, feel comfortable and enjoy a great time in one of the city’s most exciting new breweries. By connecting the history of the Erie Canal to this recycled downtown Buffalo warehouse, a new energy is created for a new generation.